This October, Warner Bros. Pictures and DC Entertainment will release Joker, a drama centered on the Clown Prince of Crime that, at least based on the first trailer for the film, does not involve Batman. Not only that, but the film promises to give the iconic villain a brand new origin story that provides a sense of insight into, and perhaps even understanding of, the gnarled mind of the criminal. This is not the first time such a thing has been tried. Though carving out Joker’s backstory has been a controversial move in the history of comics, a number of writers have explored the territory that writer-director Todd Phillips and actor Joaquin Phoenix will chart again later this year. There’s one consistent trend between comics, cartoons, and movie retellings: the Joker may remember the past differently at times, and might deliberately invent certain origin stories based on whom he’s talking to, so he can better manipulate them. The Joker is often an agent of chaos, so it seems fitting that his origins don’t line up perfectly. Here’s a look at different backstories we’ve been given for the villain over the years. Returning home, the criminal was horrified that the chemicals made his skin chalk white, his hair green, and his lips red. But then, partially inspired by the Monarch Playing Card Company, he embraced this and embarked on a new life of crime, almost for its own sake and joy. He became the Joker! 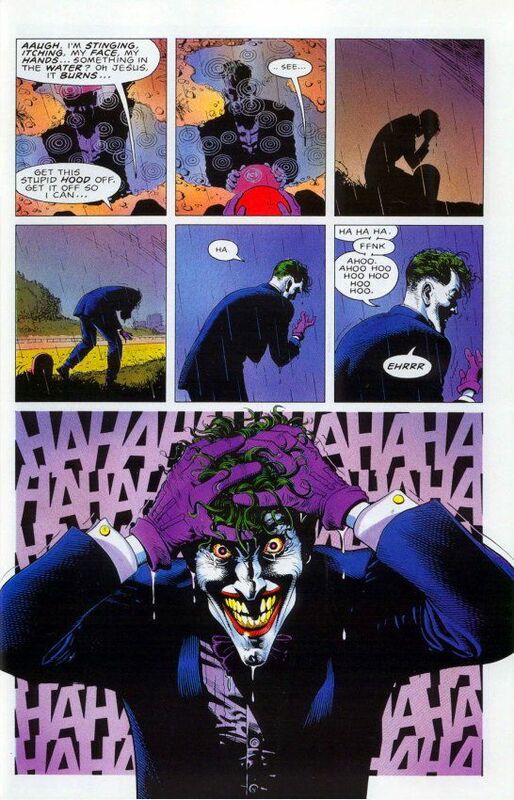 Originally intended to take place outside of canon, Alan Moore’s Batman: The Killing Joke showed a series of flashbacks that revealed the Joker to be a nameless lab worker who left his job at the Ace Chemicals plant to be a stand-up comedian. Though his wife Jeannie swears he’s funny, the man bombs. With a baby on the way and desperate for money, he agrees to help a couple of criminals break into Ace. The criminals have been using different insiders to help them rob many places, each time having them wear the helmet of the Red Hood so the police focus on the idea of one master criminal. When Jeannie dies from a home electrical accident, the chemist inches to the edge of a breakdown. But the robbery must go on. Immediately things go wrong: the police shoot down the man’s cohorts, and Batman shows up to save the day. Hoping to escape, the man jumps into the nearby lake, not realizing chemicals have been illegally dumped there. Emerging later to see that he now looks like a clown, the chemist snaps. 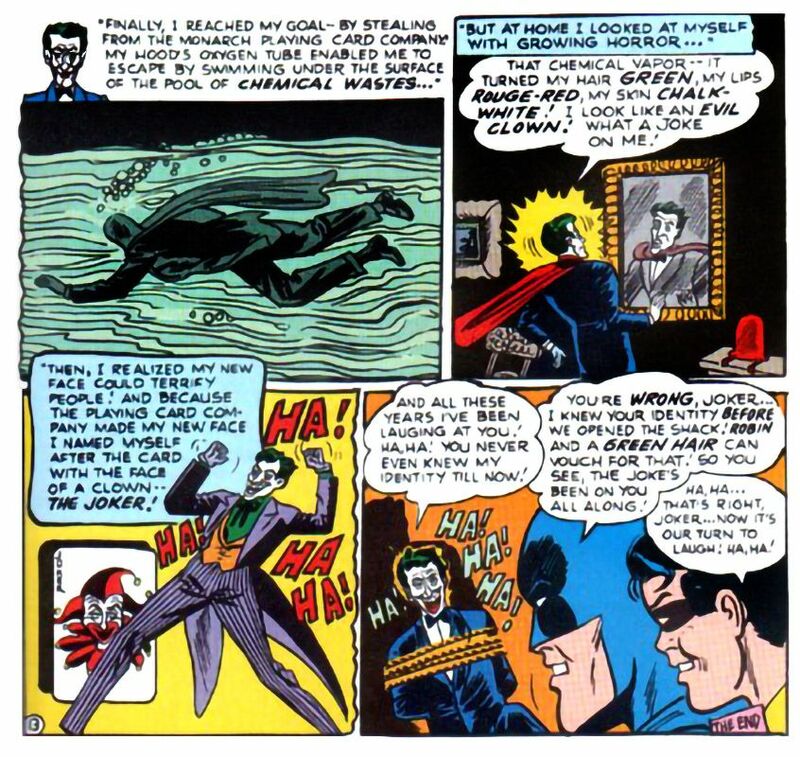 Later in the same story, Moore casts doubt on the origin story, as the Joker explains that he remembers his old life differently at times. Nonetheless, this graphic novel became canon, with the flashback largely accepted as close to the truth by future writers. Batman: Legends of the Dark Knight #50 (1993) later credited the Joker cousin with the creation of all his chemical weapons (and implied the Clown Prince’s first name started with the letters J and A). Later still, in the 2004 story “Pushback,” the Riddler corroborates at least part of the Killing Joke origin, adding the revelation that Jeannie was actually murdered by a corrupt cop. 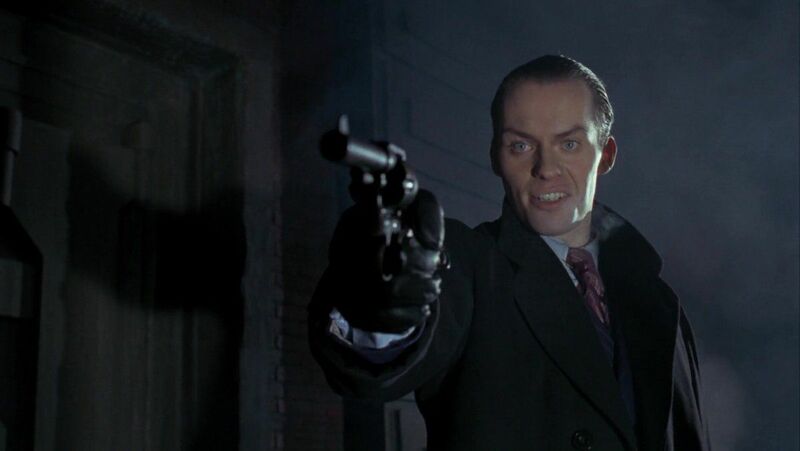 Tim Burton’s movie Batman put forth that the Joker was originally gangster Jack Napier, a vain sociopath with an interest in chemistry and art who also, it turns out, killed Bruce Wayne’s parents. An encounter with Batman at Ace Chemicals leads to his bleached skin, but it’s a wound he suffers during a battle with the Dark Knight (along with back alley surgery) that results in him having a permanent smile. Viewing the experience as a rebirth, he decides to rebrand himself as a homicidal performance artist who will destroy Gotham across the board. He blames Batman for his creation, but the whole parent-murder thing makes the reverse is true as well. Though this Joker backstory never jumped to the comics, Batman: The Animated Series adopted “Jack Napier” as the Joker’s name (or, perhaps, just an alias he used while he was a mobster and hitman). One episode “Make ‘Em Laugh” adds a wrinkle when Batman finds video footage of a stand-up comedian named “Smilin Shecky Rimshot” bombing on stage and recognizes the performer as the Joker. While a nod to The Killing Joke, it’s also clear that this stand-up act happens long after Jack Napier became the Clown Prince of Crime. 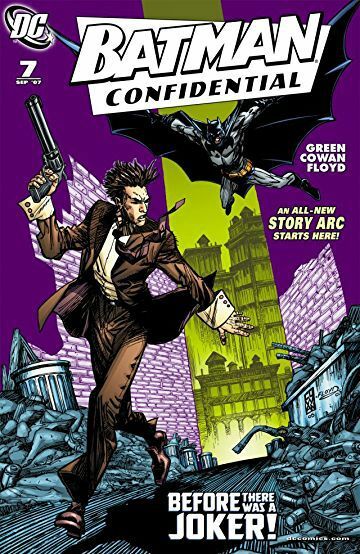 Batman Confidential, a series where different creative teams could tell stories that didn’t have to worry about being canonical, struck a chord with fans. This particular story features Jack, an accomplished bank robber and former hitman for the Berlanti crime family who’s now bored and despondent with life. But then he encounters Batman, and is excited to test himself against such an enemy. Immediately, Jack embarks on a crime spree that makes Bruce Wayne feel as if all his work so far is coming undone. When the two finally confront one another, the battle quickly escalates. Batman reluctantly uses a gun to disarm Jack, who then stabs a person in retaliation. As Jack attempts to flee, Batman throws a batarang that winds up cutting across the criminals face. Batman is so enraged by Jack, he actually leads angry mobsters to the man, telling them to do with him what they will. The mobsters take Jack to the Green Pharmaceutical plant and beat him up. The criminal is able to free himself and fight for his life, and in the chaos the plant’s machines are activated. Batman, regretting his actions, arrives just in time to see a chemical mixture pour down onto Jack. The criminal escapes into the night, only to then return as the Joker. 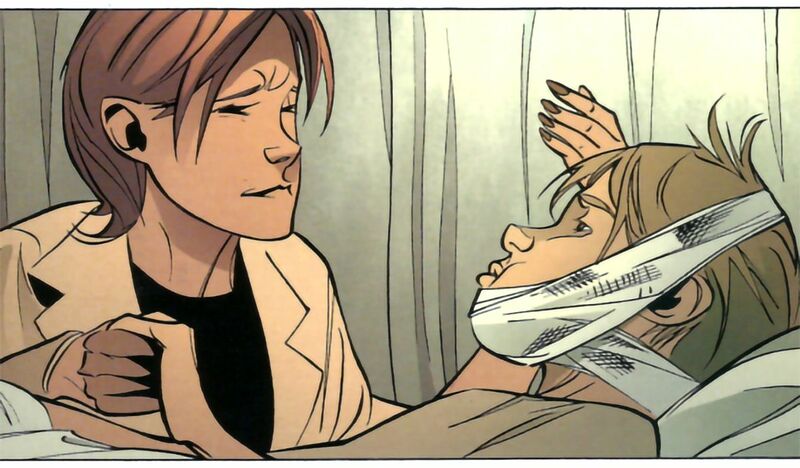 In flashbacks, this story shows young Martha Kane working as an aide at the clinic of Dr. Leslie Thompkins. There, she regularly looks over Sonny, a young boy in foster care who suffers frequent abuse from others. Sonny is there to witness when Martha meets young Dr. Thomas Wayne. Weeks later, a group of criminals who want to gentrify the area infect Sonny with a virus meant to spread through the low-income neighborhood. Sonny warned Thomas and Martha what was really happening, so the clinic doctors and the Wayne Medical Research team were able to save him and stop any possible epidemic. In this version of events, part of the new canon for the DC universe, a criminal called Red Hood (or Red Hood One) leads a whole gang of red masked people on crime sprees across Gotham months before Bruce Wayne adopts the Batman identity. 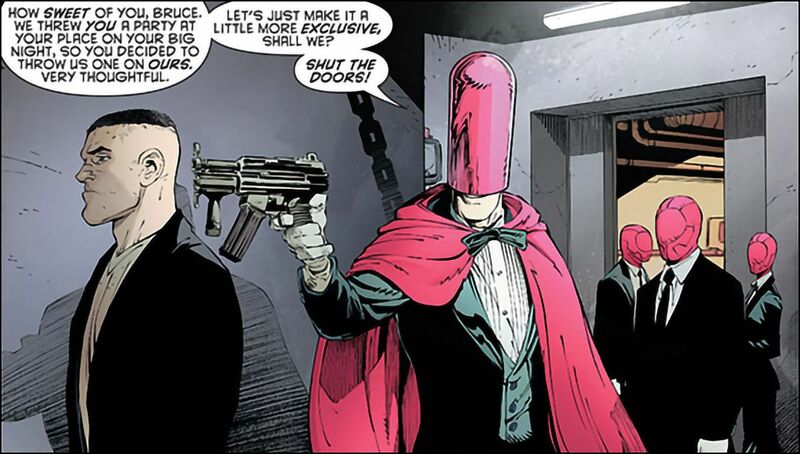 Each of Red Hood One’s underlings is assigned a different number and holds different skills. When Red Hood One realizes Gotham has a new vigilante, he can’t help but be fascinated, even offering the hero a job. Red Hood One also feels a connection to Bruce Wayne, claiming he was affected by the murders of Thomas and Martha Wayne, and his own foster parents were murdered the night by their neighbors. These events inspired him on a path of not just crime, but chaos. After Red Hood One falls into the vat at A.C.E. Chemicals, authorities discover the body of Liam Distal, said to be the original leader of the Red Hood Gang. But at some point, someone else killed and replaced him, only to then become the Joker. When did this replacement happen? Before Bruce met “Red Hood One”? Later? Who told him the story of murdered foster parents? Or is the Joker actually Liam Distal, who faked his death in order to cause confusion about his identity? The story leaves that up to you.